Unfortunately, the tap water we receive today is not only contaminated but contaminated with chemicals that are very dangerous to the human body. You're probably looking at different water filtration pitcher reviews precisely so you can counter the risks posed by contaminated water. If you want to give your family the surety of pure and healthy water, then you should definitely consider Aquagear because it is easily one of the best water filter pitchers in the market. Why? Our review is the best answer to that question. Aquagear came into being nearly two decades ago. It was founded by a couple of aerospace engineers in Southern California at a time when widespread water and environmental contamination suddenly became a mainstream concern. The Aquagear water filter pitcher was designed by the founding engineers to deal with exactly this problem. One of the highlights of the Aquagear water filter pitcher is that it is manufactured within the country. The product itself catches the eye because it is manufactured without the use of Bisphenol A (BPA) and can filter out 89 different contaminants. It is also worth mentioning that the company provides excellent post-sales support to its customers. This, combined with the lifetime guarantee it offers, makes the Aquagear water filter pitcher a fairly reliable purchase. 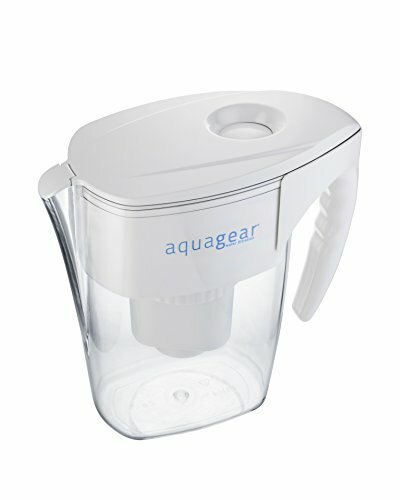 The Aquagear water filter pitcher is manufactured with food grade materials because of which it boasts of a 100% approval from the Food and Drug Administration (FDA). Not only this, the filter pitcher is also 100% vegan. The build quality of the pitcher is self-evident. It is sturdy and long-lasting so wear and tear through extended use or rugged handling shouldn’t be an issue. The design of the pitcher is simple. It has a lid with a spout on it which is basically a round hole through which you can fill the pitcher. The handle is strong and easy-to-grip, which will not only help you fill the pitcher but also pour from it. The filter comprises two components. One is made up of activated coconut carbon that is designed to deal with organic compounds. The other is a proprietary ion exchange media that removes heavy compounds and industrial contaminants through multiple physical and chemical processes such as depth filtration, chelation, chemical bonding, absorption, and adsorption. Setting up the Aquagear water filter pitcher out of the box is a three minute process. Most of this time will be spent on flushing out the filter. The Aquagear water filter pitcher is the best water filter pitcher in the market because of how effective it is at its core function i.e. filtration. Its filter is not only extremely effective in dealing with various contaminants but is also designed to last much longer than its competitors. The pores in the filter span merely 2 microns and the filtration process involves five different stages. This is why this water filter pitcher can handle 89 different types of contaminants. This is significantly more than all other competing filter pitchers. In fact, there is such a divide between this filter pitcher and its competitors that the company claims it to be able to remove 2000% more contaminants than other leading filter pitchers. Specifically speaking, the Aquagear water filter pitcher can remove chlorine, mercury, chloramines, chromium 6, lead, fluoride, arsenic, Total Trihalomethanes (TTHMs), and Volatile Organic Chemicals (VOCs). The effectiveness of the filtration of the Aquagear water filter pitcher has been tested by multiple independent labs with the NSF tests being the most prominent. The water filter pitcher even has the approval of the Water Quality Association for its ability to remove copper. The filter on the Aquagear water filter pitcher is not only effective but selectively effective. While it takes away all the harmful substances, beneficial minerals such as calcium and magnesium are left in the water. This isn't something that its competitors can offer in good faith. 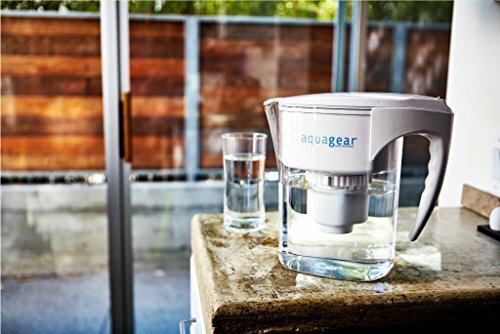 Further, the Aquagear water filter pitcher can process three times more water than its competitors. As a result, you gain long-term savings while simultaneously doing away with the hassle of replacing filters too frequently. With the Aquagear water filter pitcher, you won’t have to change the filter up until you’ve used it to purify 150 gallons of water. The downside of any highly-effective filter is that it takes longer to process the water. In practical terms, this means that you'll have to wait slightly longer to fill the pitcher. This shouldn’t bother you; however, because the time it takes to filter water is directly proportional to how pure the outcome is. Buying the Aquagear water filter pitcher will peg you back significantly more than if you went for its competitors. It is one of the more expensive options out there but that is the price you'll have to pay to get the best water filter pitcher in the market. At the same time, it is important to remember that the filter in the Aquagear water filter pitcher lasts longer than its competitors. This is means that in the long run, the Aquagear filter pitcher will recoup the extra money you pay in the beginning. In fact, if you compare the initial cost of the pitcher, cost of filters, and the changing frequency of all the water filter pitchers out there, you'll find the Aquagear water filter pitcher to be at par with industry standards. The cost of buying the Aquagear water filter pitcher will make most potential buyers hesitate and go for cheaper options like Brita. It won’t be surprising if you were one of them. After all, financial prudence is a sign of maturity. Whichever direction you take, though, it will very much be a case of you get what you pay for. Brita is one of the leading brands when it comes to water filter pitchers. This is mainly because it offers some of the cheapest water filter pitchers in the industry. Unfortunately, when you save money, you pay for it in other ways. The case of Aquagear vs. Brita is the same as choosing to eat fast food instead of cooking fresh foods at home. The latter requires more money, more time, and more effort but it is, without a doubt, the healthier option. 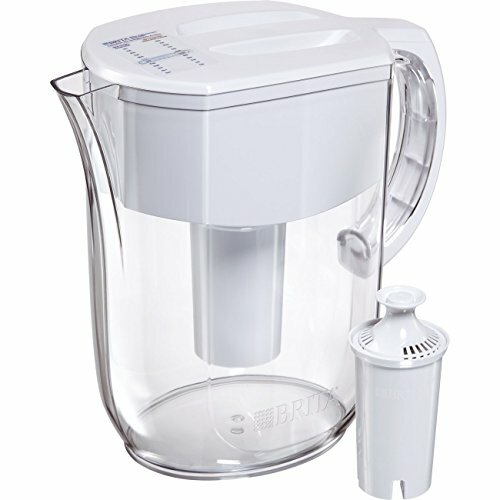 Brita offers cheaper filter pitchers because its filter isn't as effective as the one on Aquagear and its filtration technology not as cutting-edge. Consider the fact that the Aquagear water filter pitcher is capable of filtering 2000% more contaminants than Brita. This may seem like a simple marketing gimmick but think about what it means. It means that the water you drink will be 2000% more impure if you were to try to save a few dollars by choosing Brita. If those extra contaminants end up making you sick, then you can add your medical treatment costs to the mix too. Effectively, you won’t even be saving much by choosing to go after the cheaper option right now. Moreover, the filter on the Aquagear water filter pitcher is designed to last three times longer than the filter on Brita products. Therefore, because you'll be replacing Brita filter more often than Aquagear, whatever money you save will slowly dwindle away. Consequently, Brita filter will not only turn out to be less healthy but also less economical than Aquagear in the long run. Aquagear water filter pitcher is easily the best water filter pitcher that you can go for. If even that isn't enough for you to make up your mind then consider this. Your act of buying Aquagear filer pitcher will have a positive social impact in the world. 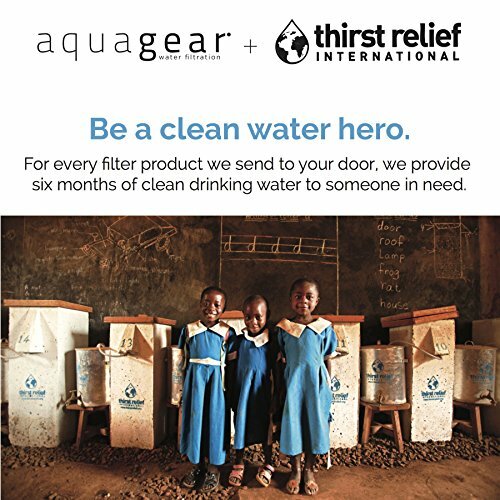 Aquagear has established the Aquagear Foundation which is a result of it with Thirst Relief International. As per their collaborative agreement, for every Aquagear water filter pitcher that is sold, Aquagear donates six months’ worth of clean water to a number of African nations including Uganda, Tanzania, and Cameroon where getting clean water is a major challenge for most families. Even your act of using an Aquagear water filter pitcher will have a positive environmental impact because the filter is completely recyclable. Therefore, by using these filter pitchers; you will not only be improving your health but also improving the environment. All you'll need to do is contact Aquagear when you want to recycle the filter. They’ll send you a postage-paid label that you can use to send them the used-up filter. Recycling the filter will have further positive social impact because the company doubles its donation to African nations for every filter recycled. As is evident from their filtration quality and their environmental and social impact on the world, Aquagear water filter pitchers offer a win-win situation in every way possible. Moreover, the fact that their filters are so long-lasting takes away most of the bite of their higher cost. So, if viewed in the long run, all these benefits wouldn’t even seem too pricey. Even when compared to other leading brands and their products, Aquagear water filter pitchers stand out in more than one way. Therefore, however, you look at it, you'll have to admit that Aquagear water filter pitchers are the best water filter pitchers in the market!